There's no shortage of hand‑wired boutique guitar amps on the market, but how about one that includes power scaling, to give you the right tone for recording, but without the volume? 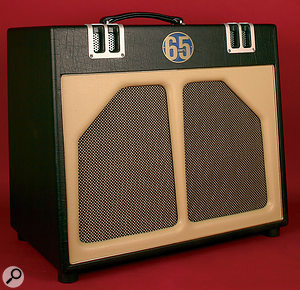 There's a lot of interest in the boutique tube amplifiers built by US company 65 Amps, but their latest combo (which is also available as head only) should be of particular interest for recording. It is rated at a practical 12W and includes the company's new Master Voltage circuit, which reduces the power further by means of dropping the valve (or tube, to our American cousins) voltage. Apparently, the design is based on an updated version of an unnamed '60s classic — and the designers certainly tip a nod in the direction of Vox when it comes to the sound and choice of tubes. The chicken head‑style controls are on the top panel of the Lil Elvis. The Master dial controls the output levels via power‑scaling, so that you can get a big sound and a lower level. 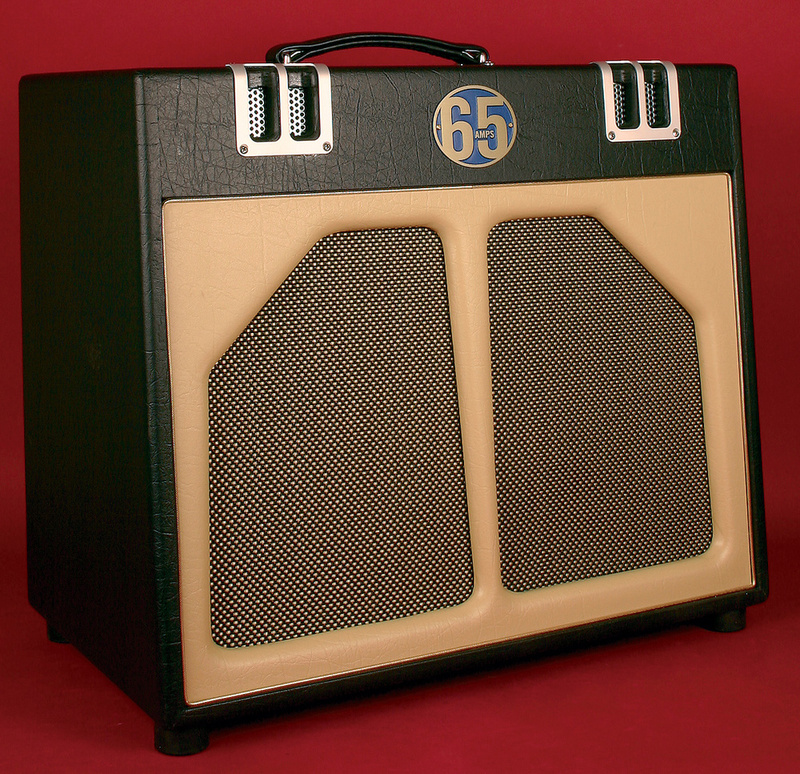 Built into an open‑backed, Baltic ply cabinet, and equipped with a Celestion G12H 30W 12‑inch speaker, the hand‑wired Lil Elvis features a pair of EL84s in the power stage and 12AX7s (ECC83) in the front end. In all, there are six tubes, none of which is fitted with a screening can. The cabinet itself is a beautiful piece of design work, with retro brown and cream vinyl covering, metal surrounds to the front air vents, and a vintage‑style strap handle. It measures approximately 13 x 18 x 21 inches, so it looks rather more substantial than its power rating might suggest. All the controls are fitted to a panel that's fixed directly to the amp chassis and recessed into the top of the cabinet. In accordance with modern health and safety directives, the tubes are mounted on the baffle side of the chassis, so that they point towards the front of the cabinet, rather than poking down into the space where many players stash their leads and pedals (not that such a practice is recommended, as it is still possible to damage the tubes and speaker if you're really careless!). All the components are the same quality as used in the company's more costly boutique amps, so the only bit of scaling down is in the power rating. The main controls certainly hark back to Vox — just volume and tone, complete with chicken‑head pointer knobs — but there are several additions that greatly extend the flexibility of this little amp. One obvious omission is spring reverb, but there's a simple effects loop that comes out on a pair of jacks, allowing the user's own effects to be added after the preamp stage. Two further knobs control the speed and depth of the Bias Tremolo, which modulates the level both up and down but, unlike traditional designs, also incorporates some clever circuitry that always allows the attack of a new chord or note to pass through at its normal level, regardless of where the tremolo oscillator is in its cycle. This neatly avoids the problem of hitting a chord only to find that the tremolo is at the bottom of its dip and your notes lose all their attack. The tremolo Intensity knob has a click‑off function but, once set, it may also be bypassed using a footswitch. Setting the depth to around four gives what might normally be thought of as maximum modulation depth, after which the effect takes on more of a 'helicopter' chopping character. Although the Lil Elvis is a single-channel amp, there's a switchable 'Bump' function that can also be controlled by a footswitch. This bumps up the preamp gain to deliver a mild overdrive that's perfect for blues or power chords, but is still very controllable. The amount of dirt added depends on the preamp volume setting and the type of guitar. A further switch, labelled 'Smooth', is (according to the designers) there to remove crossover distortion for a smoother tone — but in normal use I could hear no obvious difference between the on and off settings. Both Bump and the tremolo have status LEDs to show when they're active, and there's the usual Standby switch, as well as a power switch and a traditional red power lamp. At first glance, you might mistake the Master control for a master volume, but when you turn it quickly, the sound drops in level and then creeps back, which gives a clue as to what is really going on... 65's Master Voltage technology is very different from either a master volume or a power soak, because it acts directly on the tube power‑supply voltages, enabling the amp to run normally down to just a couple of watts without losing its character. Inside the amp, accessible via the rear panel, are the expected foot-switch and FX send and return jacks, as well as two speaker outputs and impedance switch. The amp does have something of a Vox character, with perhaps just a hint of Fender, producing solid lows and a nice chiming edge, but it also feels reassuringly 'springy' and slightly compressed, especially at lower Master settings. In fact, I much preferred the sound with Master backed off a little, because when it was turned right up the amp sound seemed to harden up rather too much, and the playing feel changed. For studio work, the Master control works really well for getting a big sound at lower levels, although you may need to adjust your tremolo depth, because this is somewhat affected by the Master setting. Some amps tend to make all guitars sound the same, but with this one my Strat sounded very different to my Telecaster, and the neck pickup of the Telecaster came across rather better than it does on many amps. Kicking in the Bump switch adds weight and a gentle overdrive to the sound, all controlled by the Volume pot; think sweet sustain, rather than grit here. At medium Volume settings, chords still hold together well, and notes sustain without seeming too obviously distorted, so it's more into John Mayer or tasteful‑blues territory than traditional rock. Of course, patching in your favourite tube screamer will put that to rights if hard rock is what you need, but as served up, solo lead lines sing out clearly, and chunky chords range from the Beatles to the Who when using single‑coil pickups and a Volume setting of around eight. There's a bit more gain available if you use the last quarter of the volume pot, which sends things veering more towards crunch, although the preamp noise also becomes more evident as you turn up the volume, especially if Bump is switched on. When I switched to a guitar with humbuckers (my Gibson SG), I could push ahead into heavier crunch territory, and achieve a more searing late '60s lead sound with no effort — so there's plenty of range to be had from a single tone control. Talking of which, although this amp does sound dull with the tone backed right off, there's a lot of usable stuff in the second half of its travel, so don't feel you have to leave it fully clockwise all the time! With Bump engaged, there was a certain amount of background hum that didn't go away when I turned the guitar right down, and this changed in level as I moved the amp around the room — which left me wondering if those unscreened preamp valves were letting in some outside interference from power adaptors and so on. If you hold the power cord and bring it near the preamp section, the hum level also rises dramatically, which is a further indication that the preamp screening could be better. While playing flat out will usually overwhelm any hum and noise, it could become more of an issue if you're one of those players who likes to work with the guitar volume control backed off for much of the time. I have to confess that the Smooth switch remains a bit of a mystery, because its effect was extremely subtle, and was most evident when I listened to the miked amp rather than to the amp directly. In fact, it is so subtle that most of the time I couldn't tell whether it was on or off... which makes me wonder whether it wouldn't have been simpler to have it on all the time and save the cost of a switch? The Lil Elvis is a versatile and characterful amplifier that excels at clean sounds and on‑the‑edge blues tones, although a nice spring reverb would have completed the picture for me. The tremolo is really clever, because it sounds normal, but you never miss a transient when coming in with a new note or chord — which is a very nice touch. The Master Voltage control system works very effectively for preserving the tone and feel of a big amp at lower power levels, which should make it ideal for recording applications. More attention to preamp-hum reduction would make it even more studio friendly, and although this isn't at all hard to put right yourself, at this kind of price you have a right to expect something close to perfection. On the whole, though, the Lil Elvis does pretty much as claimed, and I can see why a lot of big-name players have started to use it for studio recording. Although there are few amps aimed squarely at the recording market (the Fender Princeton Recording Amp is one), there are numerous boutique amps from companies such as Bognor, Boogie, Cornford, Hi‑Watt and Buddah, not to mention the Vox AC15 and Vox Night Train Head. The Orange Tiny terror is also favoured by some studio players, as are more populist models from the likes of Fender, Marshall and Peavey so the field is as wide open as your taste in sound. Power soaks, such as the Sequis Motherload, offer an alternative means of attenuation for recording. Wide range of great guitar tones. Can be susceptible to hum pickup if not positioned carefully. Lil Elvis is deserving of a place amongst the revered boutique amps, especially for studio use, where its ability to create big sounds at a manageable volume is not to be underestimated. Choosing an amp is very much down to personal taste, of course, so it pays to play through one for a while before making a decision to buy. Chandler Guitars +44 (0)20 940 5874. 65 Amps +1 818 760 5089.
email via 65 Amps web site.